It’s that time of year again, time for PalmCon! 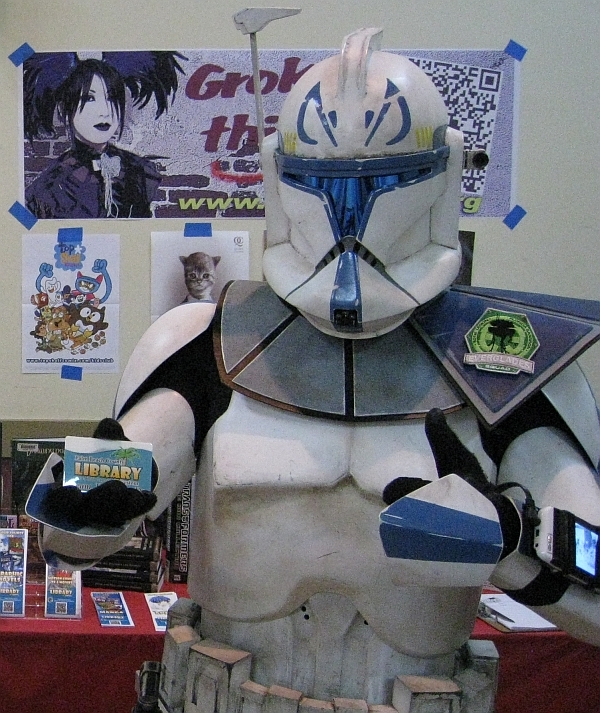 Palm Beach County’s annual comic book, anime, and sci-fi convention is back, and bigger than ever. This year’s PalmCon will be held on Saturday, September 21st from 10am-6pm at the Palm Beach County Convention Center. As always, your friendly neighborhood library system will be in attendance. We’ll have goodies for the kids, including coloring pages featuring Super Dewey, a beanbag toss game, and more. Stop by the Palm Beach County Library System’s booth dressed as your favorite character and show off your library pride. We’ll be taking pictures throughout the day of attendees with their library cards. Don’t have a PBCLS library card? No worries, you can sign up for one right at our booth. Check out our PalmCon Facebook Event Page for all the details. See you Saturday. Excelsior! The people attending PalmCon: The Palm Beach County Comics Book and Collectibles Show held in Greenacres, FL, on September 17 had a chance to connect with the Palm Beach County Library. The convention organizers had offered the library a free booth at the convention, and staff saw it as an excellent opportunity to expose the library’s collection to an audience that might not be aware of everything the library had to offer (such as ebooks). “We were there to promote the library and give out information of what we provide, particularly our graphic novels, manga, and our anime club,” said Kelly Handy, a library associate, who was one of seven staff members who handled booth duties at the convention and circulated among the crowd of about 500 attendees. Read more: Comic Convention Provides Exposure for a Library and Its Collection.